AFTER JUST A SHORT DRIVE to Natchez, Mississippi, you are soon immersed in its historic past. Natchez, the oldest European settlement on the Mississippi River, is one of the few places in the United States with over 500 buildings constructed prior to 1860. A quaint little town filled with historic homes, antique stores, restaurants, a beautiful cathedral and a lovely cliff-side view of the Mississippi, Natchez has much to capture your attention. Our visit brought us to town for the Spring Pilgrimage, an event hosted by the Natchez Garden Club since 1931. 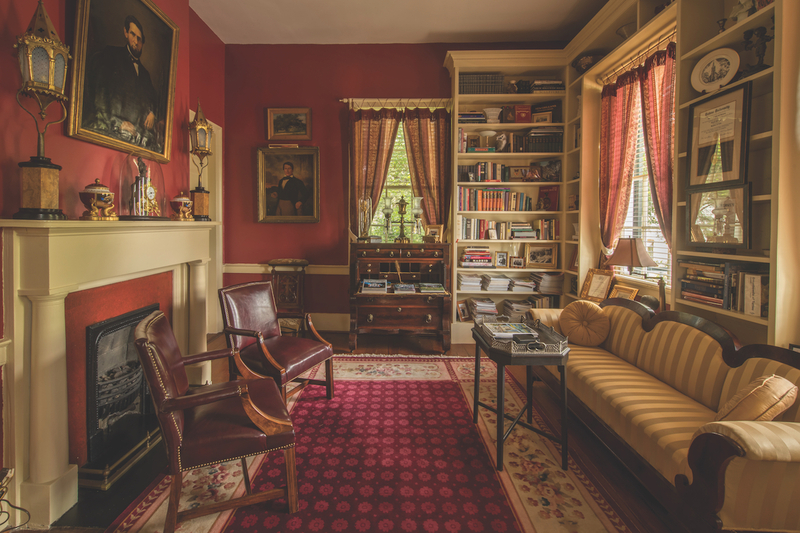 During this month-long event, many of the historic private homes are opened to the public for tours, as well as several owned by the Natchez Pilgrimage Garden Club. Some are hosted by descendants of the original owners dressed in period costumes. Along with the home tours, you are treated to a history lesson that recognizes not only the original homeowners, but also the workers and their families who contributed their lives to these homes. To truly experience the historic feel of Natchez, a stay in one of the historical bed- and- breakfast inns is a must. While there are many to choose from, our choice is the historic Oak Hill Inn. Built in 1835 by William A. Beatty for his wife, Elizabeth, the home features the traditional center-hall design and an expansive front porch for lazily enjoying the afternoons. Doug Mauro and Donald McGlynn, New Jersey natives, were frequent visitors to the New Orleans area when they took a side trip to Natchez and fell in love with the town and the people. While Donald was planning an early retirement with hopes of settling in Natchez, little did he know that Doug had kept that dream alive by reaching out to a Natchez realtor to search for their future home. After they visited three antebellum homes, Oak Hill spoke to them, saying “this is home” when they walked through the door. Purchased in early 2004, Oak Hill was returned to its former glory following two years of loving restoration. Awarded the 2005 Restoration Award by the Natchez Historical Foundation, it has been ranked one of the best inns not only in the United States, but also in the world. The hospitality offered by Doug and Don is beyond compare, and the gourmet breakfasts served could stand up to any 5-star restaurant. With only three guest rooms to offer, you are treated as a close family friend when you stay here. Their home is filled with beautiful period furniture and many antiques acquired by Doug’s great aunt, whose past takes us back to another part of history. Bessie Fisher left home in her teenage years and became a Powers Model in New York City, where she caught the eye of Florenz Ziegfield and became one of the early Ziegfield Girls. While performing, she met A. J. Stasny, an up-and-coming music composer. They married and went out on a limb to start the A. J. Stasny Music Company, which, by the early 1920s, became one of the largest music publishing companies in the country. Sadly, the Stasnys had no children of their own, and Mr. Stasny died in 1923, leaving Mrs. Stasny to build and manage their company. She traveled worldwide, buying antiques along the way. Doug, being one of her few relatives with any appreciation for antiques, was quick to obtain a few upon her death. Many of these items are now scattered throughout Oak Hill Inn. One of his most prized possessions is a marble lamp made of solid Carrera marble hand carved and sculpted by A. Petrelli in 1850. The top globe of translucent alabaster was originally gas powered and was later converted to electricity. The Stasnys purchased the lamp in 1919 for $3,800. Upon arrival at Oak Hill, you are greeted with mint juleps and homemade chocolate chip cookies to begin your immersion into true Southern hospitality. Doug lovingly leads you on a tour of their home, filling you in on its history and their large collection of antiques. The following morning, you are treated to a gourmet breakfast, which could include any of the following: eggs benedict or fresh herb frittata with peaches-and-cream French toast, mascarpone-filled crêpes topped with fresh berries, homemade biscuits and brioche rolls and plantation potatoes or grit cakes. You do not leave hungry or dissatisfied. Oak Hill Inn is the perfect setting for a getaway to enjoy all that this historic town has to offer.